A couple of weeks ago, an experienced Eurofighter Typhoon industry test pilot wrote to The Aviationist to reply to a Lockheed F-35 test pilot who, talking to Flight’s Dave Majumdar, had claimed that all three variants of the Joint Strike Fighter will have better kinematic performance than any fourth-generation fighter plane with combat payload, including the Eurofighter Typhoon. At that time, we said that the F-22 tends to lose too much energy when using TV and unless the Raptor can manage to immediately get in the proper position to score a kill, the energy it loses makes it quite vulnerable. We have all been around long enough to recognise there is not a single sensor able to turn the night into day, nor a unique aerodynamic design feature capable of ensuring by itself air dominance if implemented. 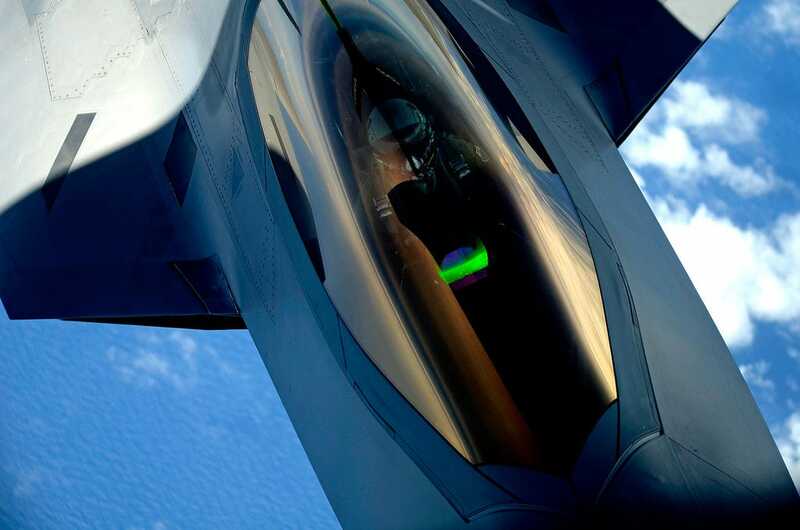 The effectiveness of an air superiority fighter relies on the successful combination of a range of design elements including thrust-to-weight ratio, wing loading, avionics and weapons integration. Furthermore, appropriate tactics and valuable aircrew training must be developed to exploit the full potential of the weapon system. Thrust Vectoring is one of the design elements that can contribute to create a certain advantage during close air combat by generating impressive pitch and yaw rates, but only in a limited portion of the flight envelope at velocities well below “corner speed”. Moreover, Thrust Vector operation requires the pilot to “create the opportunity” for its usage, spending valuable time in manoeuvring the aircraft to achieve a suitable condition and managing the activation of the Thrust Vector Control. If you are “defensive” and your aircraft has Thrust Vectoring, you can possibly outturn your enemy, but that most likely won’t prove to be a great idea: an energy fighter like the Typhoon will conveniently “use the vertical” to retain energy and aggressively reposition for a missile or gun shot. Also the subsequent acceleration will be extremely time (and fuel) consuming, giving your opponent the opportunity to tail chase you for ever, exploiting all its short range weapon array. If you are “neutral,” when typically vertical, rolling and flat scissors would accompany the progressive energy decay, similarly performing machines would remain closely entangled, negating the opportunity for Thrust Vector activation. If you are “offensive,” probably stuck in a never ending “rate fight,” Thrust Vector could provide the opportunity for a couple of shots in close sequence. Make sure nobody is coming to you from the “support structure”, otherwise that could be also your last move. Eurofighter has decided to develop for the Typhoon High Off-Bore-Sight Weapons, supported by Helmet Cueing, to retain energy and target tracking ability while manoeuvring WVR (Within Visual Range) at relatively high but sustainable Angles of Attack. For those who may require some additional AoA, the “Strakes” package is progressing well and soon it will be offered to Typhoon’s Customers. Nevertheless, Strakes is not purely about extreme AoA, but also suitable Roll Rates and manageable energy characteristics. Because in the European way of doing things, an all around balanced solution counts more than a single eye opening performance. It is a fact that against Eastern produced fighters provided with Thrust Vectoring, throughout the years the Typhoon has showed an embarrassing (for them) kill-to-loss ratio. Even if this can be true, the risk of coming to close range is still high. At a distance of about 50 km the Typhoon IRST (Infra-Red Search and Track) system could be capable to find even a stealthy plane “especially if it is large and hot, like the F-22″ as a Eurofighter pilot once said.